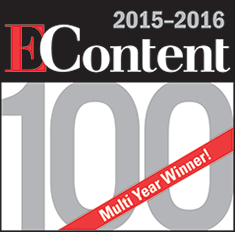 La Jolla, CA, USA — December 2, 2015 — MadCap Software today announced that it has been named to the 2015-2016 EContent 100 List of Companies that Matter Most in the Digital Content Industry in the Content Creation category. Companies selected for the EContent 100 List were evaluated by a team of judges including editors from Information Today, Inc., EContent magazine contributing editors, and other industry experts. The full list appears in the December 2015 issue of EContent, and it can be viewed by visiting http://www.econtentmag.com/Articles/Editorial/Feature/The-Top-100-Companies-in-the-Digital-Content-Industry-The-2015-2016-EContent-100-107559.htm. The EContent 100 List of Companies that Matter Most in the Digital Content Industry changes with the industry it celebrates. As usual, the trends of the past year can be seen in the list, but so can themes for the year to come. For instance, if you have recently searched for a new digital marketing platform to work with, you’ll know that the field is growing rapidly. Meanwhile, the importance of tailoring your content to global audiences is growing. The 2015 EContent 100 List reflects these changes and more. Congratulations to the companies–both old and new–that earned the respect and admiration of our panel of judges,” stated EContent Editor Theresa Cramer. The MadPak Professional Suite is the industry’s most comprehensive and award-winning authoring suite, featuring integrated, XML-based products that provide an end-to-end solution for content development, translation and publishing. It features MadCap Flare for single-source, multi-channel publishing; MadCap Contributor for editing, reviewing and contributing to Flare content; MadCap Analyzer for analyzing and optimizing Flare-based content; MadCap Capture for image capture and graphics editing; MadCap Mimic for publishing software simulation movies, video and audio, and MadCap Lingo for facilitating and streamlining the translation process. MadPak is now the trusted content publishing solution for thousands of companies worldwide, who are reducing project completion and publishing time from 30% to more than 400%. Additionally, MadCap Pulse is the first socially enabled platform for technical communicators, which adds a social layer to published content. Together, MadCap Pulse and MadCap Flare lets authors deliver socially enabled online documentation that allows users to connect, collaborate and share knowledge while gathering important statistics and reports from other content creators and authors. The newest addition to the MadCap family of products is the Microsoft® Word-based multi-channel authoring tool, Doc-To-Help. Doc-To-Help offers rapid authoring and publishing capabilities using Microsoft® Word to create online help, policy & procedure guides, eBooks and more.Doc-To-Help is ideal for users who want to create and manage content in a familiar chapter-based Word environment. For subscription information, visit econtentmag.com/Subscribe. For information about advertising, visit econtentmag.com/Advertising. MadCap Software, the MadCap Software logo, MadCap Flare, MadCap Lingo, and MadCap Analyzer are trademarks or registered trademarks of MadCap Software, Inc., in the United States and/or other countries.